Aidan Campbell is our newest am on Foundation. Aidan has been traveling and filming with the Foundation & Toy Machine teams for the past year so it was just a natural fit for him to ride for Foundation. Aidan's fist board was a Foundation Whipper Snapper so Foundation is where he says he feels at home. Watch Aidan's "Welcome Home" intro video here. Taylor Smith, Jeremy Leabres & Collin Provost warm up on the TUM YETO mini ramp before hitting the streets of San Diego. Jeremy learned inverts... well sort of. "Ed Templeton doesn’t just put you on Toy Machine. It is a thoughtful, and altogether meaningful move for one’s career when Ed makes that move and supports your placement on the team. Collin Provost is the kind of skater though who — hailing from Ed’s hometown of HB — makes Ed’s job easy. With a throwback, very committed, very authentic approach to skateboarding, Collin reminds one what skateboarding is about. His parts in Stay Gold and more recently in Emerica’s Made have proven that. Lurk at the Halloween demo via video format courtesy of Ride Channel. Back in 2011 some of the Toy Machine team traveled out to Atlanta, Ga and the crew's photos were somehow lost, stolen misplaced or possibly vanished from a hard drive. The good news is that we were just notified that our good buddy Max Yoder who filmed and showed us around ATL pieced together a few of the clips that went missing from that trip. Thanks Max! Good Times & Great Oldies. Foundation Super Co Welcomes Aidan Campbell to the Team! We're excited to announce Aidan Campbell as the latest addition to the Founation Super Co! Stay tuned for a welcome video edit soon. In the meantime check out his past welcome edit for Etnies. 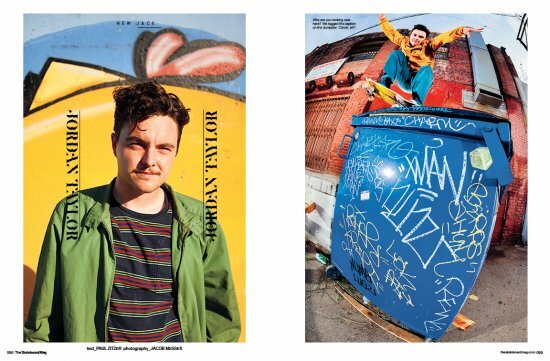 Pick up a copy of the December #129 issue of The Skateboard Mag to get caught up in the world of Jordan Taylor and get informed about his alter-ego Brad....and oh yeah, there's lots of epic photographs too! Louie Barletta is coming in hot this month, gracing the cover of Thrasher Magazine... and dropping an interview in Transworld Magazine! It's no coincidence that this media takeover coincides perfectly with the world premier of Enjoi's new full length video, Oververt! We're all looking forward to Sweet Lou's part, indeed. Stay tuned for Louie's part to drop on Thrasher Magazine. Nobody's Puppet...Louie Barletta serves an up Eggplant along with an interview with Transworld Magazine. Download Josh Harmony's new album with Freckles for FREE! Josh Harmony's new band Freckles, are very pleased to announce their first release is available for FREE at noisetrade.com/frecklesband/freckles! It be on iTunes soon as well. Feel free to tell somebody! All songs were recorded live in Josh's garage. Raw jocks, prepare to have your eyeballs kicked in the nuts with this one! Classic Toy Machine gnar meets uncanny fluidity on the unforgiving streets. Get ready to get schooled! Habitat team riders, Al Davis & Brian Delatorre take it to the streets of London in this new GX:1000 edit presented by Thrasher. Corey Duffel digitally spun a #duffmanjams October themed playlist, complete with 24 omnious tracks to celebrate his new pro wheel. Foundation Skateboard's AM team rider, Joey Ragali spins a new Super Sounds playlist with a solid mix of legendary music artists for your ears. Listen and Enjoy. Corey Duffel's Top Halloween Movies! To celebrate Duffel's Jack-O'-Lantern pro wheel and his favorite holiday, we asked Corey to list his favorite Halloween-themed movies. Here's 15 of Duffel's favorite Halloween flicks, in no particular order. Duffel's Jack-O'-Lantern wheel is available here and your local skateshop! Light up the streets with Duffle's new Jack-O'-Lantern speed-line wheel! Jack-O'-Lantern wheel available here and your local skateshop!